If you are a Greek fisherman, this recipe for kakavia (in Greek: κακαβιά, say: ka-kahv-YAH) makes sense. However, for those of us that are not, let us explore this recipe. Imagine being a fisherman and you find yourself out all day long. Catching whatever you can to bring back and sell. You are not picky. If it makes money, you are trying to catch it. After everything's said and done, you have a variety of fish and nothing to eat. What do you do? You make fisherman's soup! You can add in all your different kinds of fish, some potatoes, and veggies, and some water and you have your base. Now, it’s just a matter of seasonings and perfecting it. Nothing is wasted, and that is key. At the end of the day, you used all you caught and not only that - but you are filled. Thus, you are a happy Greek fisherman. A very happy one indeed. Kakavia, Greek fisherman's soup, is a classic Greek dish. Often compared to the French bouillabaisse, any Greek will tell you that it's tastier and easier to make! Traditionally made with the catch of the day, this dish is made with a selection of fish and seafood that can be changed with the seasons, as long as the fish are fairly small and suitable for boiling. In a large pot, add all soup base ingredients except zucchini and lemon juice and bring to a boil. Boil over medium-high heat for 15 minutes, then add zucchini. In order to prevent pieces of spine and bone from getting into the soup, wrap whole fish loosely in a piece of tulle and secure. Add fish, lobster (if using), and cuttlefish (if using), to the soup base. When boil resumes, cook for 20-25 minutes, uncovered. 5 minutes before cooking time is up, add lemon juice. Traditionally, the whole fish, other seafood, and vegetables are placed on a large platter, and the soup is served separately in a tureen or individual soup bowls. 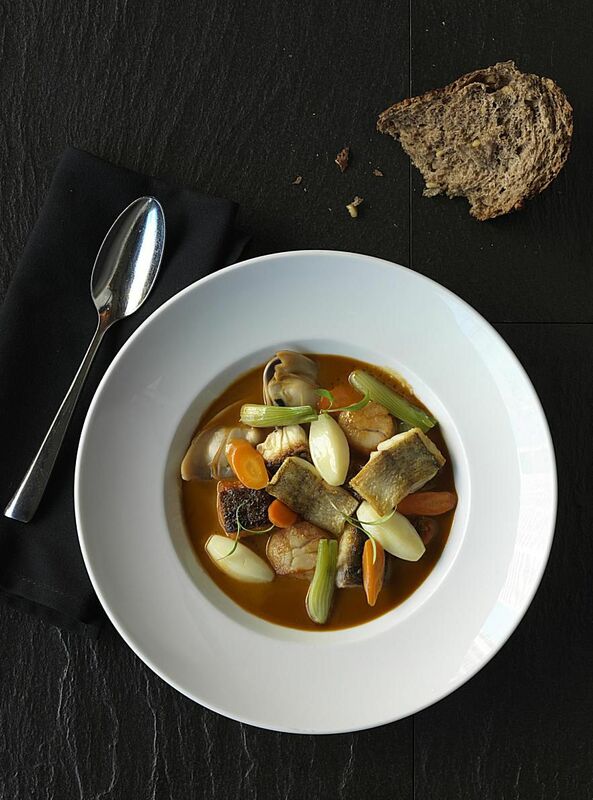 Note: For a similar soup using larger fish, see Greek Fish Soup - Psarosoupa.